King's first novel since Bag of Bones (1998) builds on the stylistic improvement begun with his splendidly well-written The Green Mile (1996). 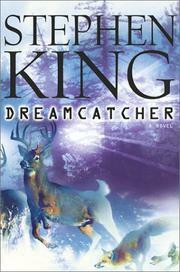 Dreamcatcher may at first seem a falling off, as the opening pages crank up the plot and four lads in Derry (see It and Insomnia) exchange vulgarities, but by the halfway point an immense fluff of seeming irrelevancies coalesce into a tight storyline and King has well and truly roped readers for the big ride. The four lads—Gary "Jonesy" Jones, Joe "Beaver" Clarendon, Henry Devlin, and Pete Moore—rescue retarded Douglas "Duddits" Cavell from gross bullying by big Richie Grenadeau. Later, in a communal dream, the four boys and Duddits find Richie beheaded in a ditch, a horror revealed piecemeal over several hundred pages that turns out to be real. The five have literally dreamed Richie dead. This spine-shaking ability comes up against a huge psychic enemy: the invasion of the planet by a thinking fungus that means to take over all species. King hints at a debt to Brian Lumley's great short story "Fruiting Bodies" and tells how the red fungus (called "the Ripley" after Sigourney Weaver's character in Alien) represents all the ETs we have seen in films by Spielberg, Cameron, and others. Twenty-five years later, Jonesy is a history teacher, Henry a shrink bedeviled by suicide, Pete a car salesman, and Beaver a happy-go-lucky partygoer losing his wife. The men meet for a week of deer hunting up in Maine. What they find is the red fungus, escaped from a crashed UFO destroyed by the Air Force and spreading like superflu in The Stand. Only the seemingly retarded Duddits can summon the Dreamcatcher that draws them together and gives them the force to fight a human villain: Kurtz (yes, that Kurtz), a psychotic military officer killing "grayboy" aliens and all humans infected by the Ripley. Top suspense with a surreal climax you'd have to read twice if the epilogue didn't spell out its layered complexities.